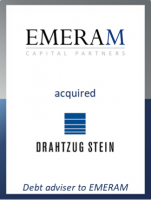 GCA Altium acted as debt adviser to EMERAM Capital Partners on the acquisition of Drahtzug Stein-Group, a leading producer of high-quality wire products in the areas of home appliances, bath & furniture, agriculture, automotive and medical technology. In the household appliances segment, Drahtzug Stein is the undisputed market leader for high-quality dishwasher baskets in Europe and the US. Drahtzug Stein manufactures wire products at seven locations in five countries. In order to support the future expansion of the group, the shareholding family aimed for a partner that ensures the group’s market leading position and future successful development. EMERAM was chosen due to its long-term oriented value maximising investment approach, its high degree of operational and strategic experience as well as its excellent network. The owner family will retain a significant stake in Drahtzug Stein after completion of the transaction, which remains subject to antitrust approval. Following a comprehensive selection process involving several financing options, the transaction was finally structured through a club of savings banks from Southwest Germany. The financing package consists of long-term acquisition facilities as well as a working capital and growth facility. Korbinian Knoblach, Founding Partner of EMERAM, commented: "Drahtzug Stein is an innovative high-quality supplier with a long tradition and an excellent basis for further growth. We see many attractive prospects in other international markets and in related business segments. As a leading manufacturer of high-quality wire products, the company has a first-class reputation among its customers, which will support our planned expansion of Drahtzug Stein."